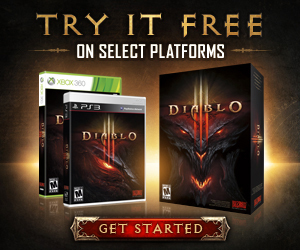 Interested in signing up for an advance look at Diablo’s coming invasion of Sanctuary? To be eligible to participate in the Diablo III beta test, you need an active Battle.net account with any Blizzard game title attached to it. If you don’t already have an account, it’s easy to create one. Once you’ve set up a Battle.net account, or if you’ve already got one, you can access it by visiting http://us.battle.net/en/ and clicking the Account button on the upper right. Then, to opt into the beta, just click the Games & Codes section of your Account Management page, and then select the Beta Profile Settings option from the drop-down menu. You’ll be prompted to download the System Check beta opt-in application; running it will opt you in to the Diablo III beta. If your system specifications change, you can run the System Check application again to update your information. While running the System Check application doesn’t guarantee you a place in the Diablo III beta, we wish you luck and hope to see you in Sanctuary. Beta testers are chosen according to their system specifications and other factors, including an element of luck. Our goal is to have a good variety of system types to best test compatibility. Will there be any other ways to get into the beta besides the opt-in? We’ll very likely be providing beta entry giveaways through various promotions on our sites, as well as through our official fansites. We’ll have information available on these promotions as they approach. You’ll be able to try out all five character classes and experience the early stages of Diablo III from the start of the game through the Skeleton King encounter. You’ll be able to interact with new and returning characters in New Tristram and fight the reawakened evils emanating from the cursed Tristram Cathedral. Will the PvP arenas be available in the beta? We don’t plan to include the PvP arenas in the beta test. We currently plan to test the functionality of the Diablo III gold-based auction house sometime after the initial beta launch. Yes, Mac users will be able to participate in the beta at the same time as Windows users.